A mask is a strong cultural touchstone. From the plains of Argentina to the theatres of Japan, from the islands of the Pacific to the street parties of Italy, masks encapsulate tradition, belief and ritual. 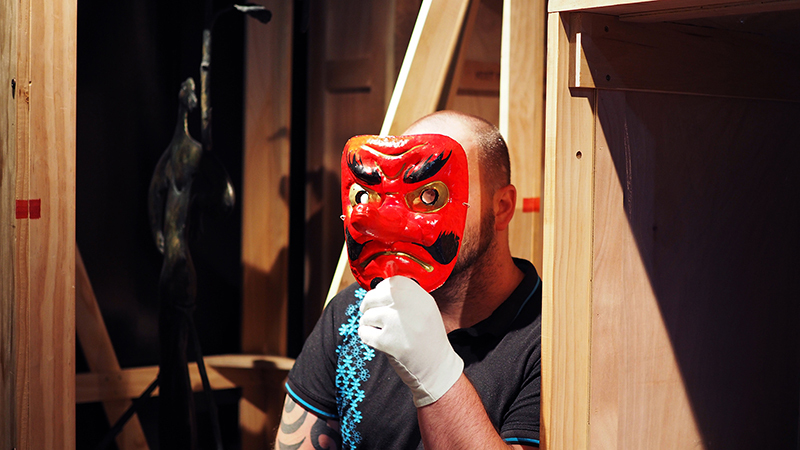 The Te Manawa collection houses dozens of masks from around the globe. 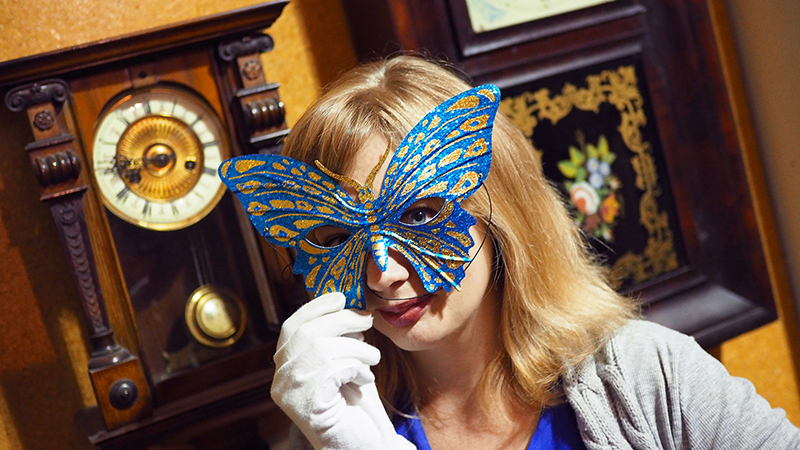 The museum’s activities during the Festival of Cultures will have a mask theme, so here we present just a small selection of the collection, modelled by staff in areas of our buildings that are little-seen or typically closed to the public. 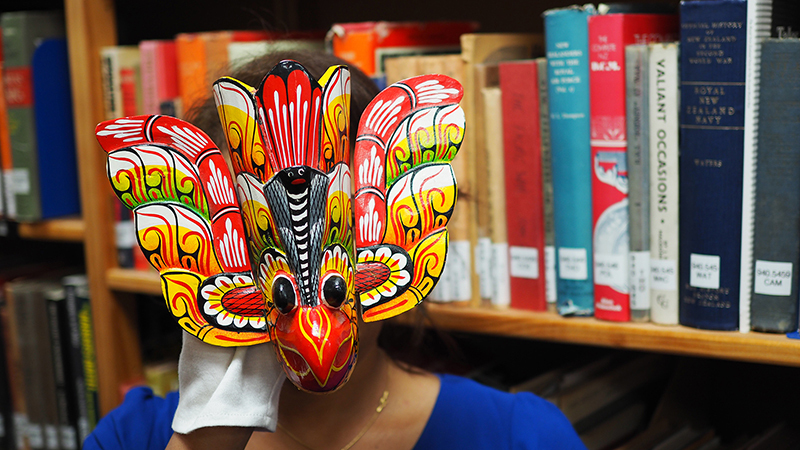 This mask represents the Gurulu, a Sri Lankan bird “raksha” (devil) who is said to bring good luck and ward off evil spirits. Masks such as this are hung by the entrances to dwellings in the hope that these blessings will be bestowed on the home. It is photographed in the Colin McVicar Research Library. Colin McVicar developed a love of books during his long stay in Italian prison camps in WW2. He became a long-time museum volunteer, and bequeathed his book collection to the museum upon his death in 1987. Filled with history books of all kinds, our staff use the Library to research new collection items and programmes. A Venetian Carnival mask can take a myriad forms. This one is quite simple, with blue and gold glitter layered over a butterfly shape, but by no means is it Te Manawa’s only one. The clocks hang in the collection store, a vast space at the back of the museum that houses just about every item we have. Keep an eye on our What’s On page, because guided tours of this space are sometimes available during events such as Local History Week. A Mexican craftsperson took a kerosene tin and turned it into this Aztec-style decorative mask. It was bought in the 1960s by a local traveller and now lives in our collection. The forge is a blink-and-you-miss-it location in our Manawatū Journeys exhibition, lying behind the tractor and on the way to the caravan and Four Square. 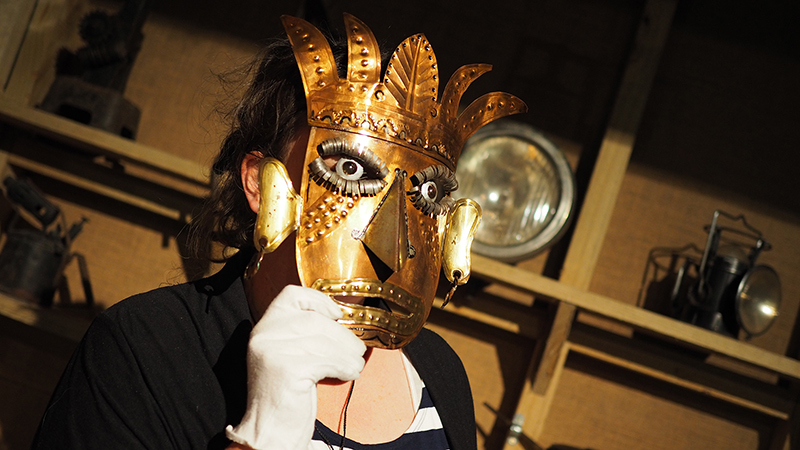 It’s filled with objects that might be found in an early- to mid-20th century workshop – perhaps not unlike the one where this mask was made. 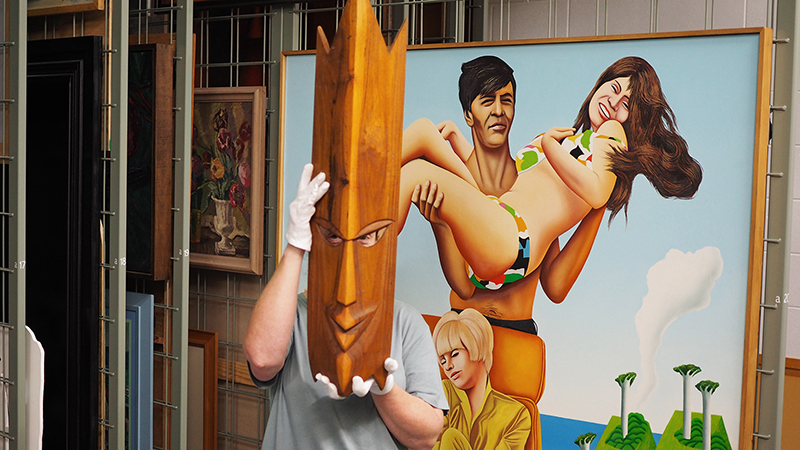 This carved wooden mask of Samoan origin is here contrasted with Ian Scott’s famous (and, in the late 1960s, controversial) painting Golden Dreams, which lives in the painting store in the Art Gallery. In this space, its environment carefully controlled, framed works both large and small hang on racks until they are chosen for an exhibition. You can see this arrangement reflected in Gallery 2, where collection works are displayed in the same way they are stored. Kagura is a type of masked Japanese theatre, where the players represent divine beings. This mask is “no-mikoto”, a suffix denoting one of the gods of the Shinto religion. The visible sculpture store is in the Art Gallery, where Te Manawa’s collection of sculptures is constantly on display. Different objects are periodically rotated through the foreground – eventually we’ll have shown you everything! High-resolution versions of these pictures can be found here.